On the IBM Watson Media platform, you cannot directly overwrite existing videos with a newer version of the video. Instead, you will need to upload the new version of the video directly to your channel, then change the video description and update video privacy for both the older and the newer versions of the videos. You can find instructions for directly uploading videos to a channel here. 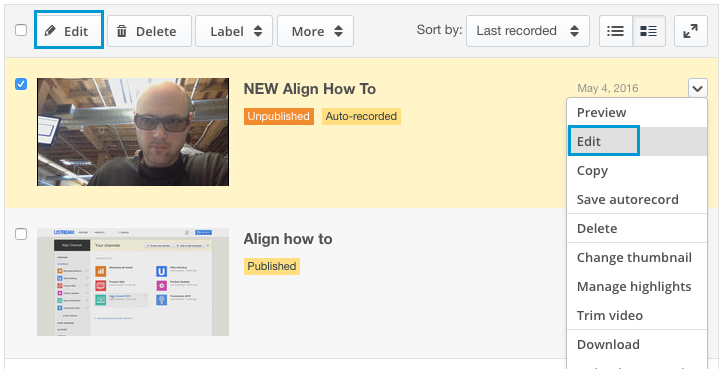 In this example, we can see an older video labeled 'Align how to' and a video we just uploaded to replace it called (currently) 'NEW Align How To'. We want the older video to no longer be available, and the new video to be visible. Our first step is to rename the new video. You can, for the time being, give it a duplicate name if you choose. Select the new video by clicking anywhere in the video's row, and click 'Edit' from either the top of the tab or the dropdown arrow on the right. 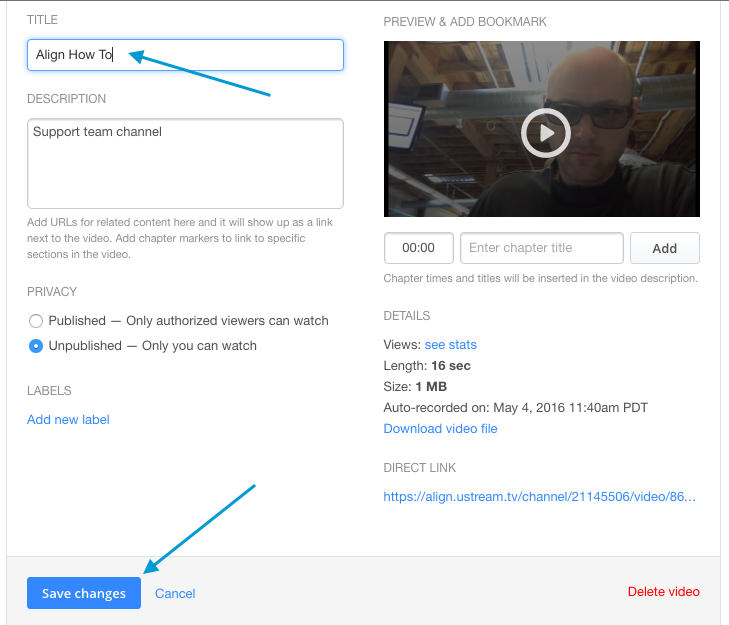 Once in the edit tab, you can make many changes to the video, including renaming the video. Simply type the new name in the name field, and click 'Save' at the bottom of the tab to save your changes, then close the tab. Your video is now renamed. Your next step is to select the older video and hide it from viewers on your channel. This is done by setting the video status to 'unpublished'. Select the older video, and choose 'set privacy' from the more dropdown menu at the top of the tab. This will open up the privacy settings menu. 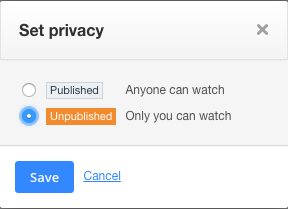 Choose 'Published' to make a video available for everyone with channel access to be able to see, or 'Unpublished' if only you as the channel administrator should be able to see. In this case we will choose 'Unpublished' to hide the older video. Remember to click 'Save' after making your selection. After setting the older video to 'Unpublished', we will use the same steps to change the new video to 'Published'. Once that is done, the labels for each video will show their current status. 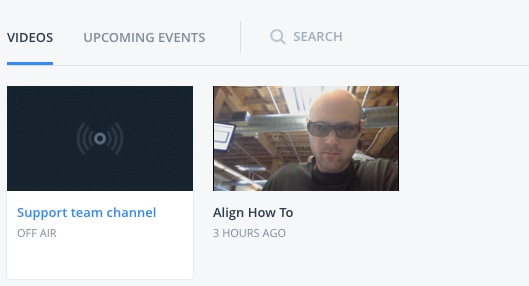 Visitors to your channel will now see the new video, and not the old. What happens to my videos when I switch from Pro Broadcasting / Streaming Manager to Basic?